For family members who care for an elderly loved one, it can be difficult to determine when he or she needs professional at-home care in Oshkosh. If you are struggling to decide when the time is right, pay attention to the following signs. When your loved one exhibits any of the following, it may be time to hire home care. As seniors age, keeping up with a home or apartment can become something of a challenge. Your senior loved one may have trouble vacuuming, dusting, and maintaining the condition of his or her home due to illness, injury, or even age. Noticing a decline in your loved one’s home environment is a key indicator that help is required. Warning signs to look for include dirty dishes that sit in the sink for weeks, garbage piling in the bin, or excessive clutter. Maintaining personal hygiene can become difficult for seniors especially if they live alone. This is also a common problem for those who require dementia or Alzheimer’s home care in Oshkosh. Prominent signs that your loved one is neglecting his or her hygiene include: no longer shaving, dirty laundry, foul body odor, and poor dental hygiene. If you discover that your loved one’s personal care has fallen by the wayside, it’s probably time to hire an at-home caregiver. Preparing food, especially healthy and well-balanced meals, can often escape a senior’s notice. You may witness your loved one losing or gaining weight, eating convenient but unhealthy things like fast food and frozen meals, or struggling with proper portion size. Since diet is an extremely important element of maintaining senior health and wellbeing, these signs indicate that your loved one needs either live-in or hourly home care in Oshkosh. Changes in mood, thought processes, and typical behaviors can change as your loved one ages. Mood swings, agitation, or the development of anxious and paranoid behavior can be a sign that in-home care is needed. Behavioral changes may also be a sign of cognitive decline associated with Parkinson’s, dementia, or Alzheimer’s disease, so a doctor’s visit may also be prudent if you notice changes in behavior or temperament. When you decide it’s time to hire a home care provider for your loved one, look no further than Oshkosh Home Care Assistance. Our dedicated caregivers work around the clock to deliver optimal in-home care and empower seniors to age in place with dignity. Whether your loved one needs help with housekeeping, personal care, or preparing nutritious meals, we can accommodate his or her needs on an as-needed basis. Additionally, we can customize your loved one’s care with our comprehensive Alzheimer’s, Parkinson’s, dementia, or stroke care programs. 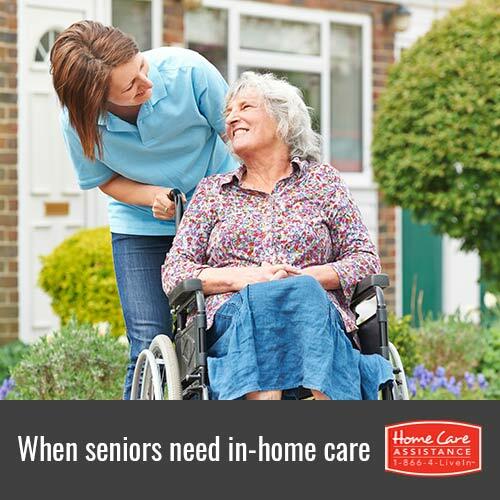 Call us today at (920) 710-2273 to speak with a personable Care Manager and learn more about Home Care Assistance.